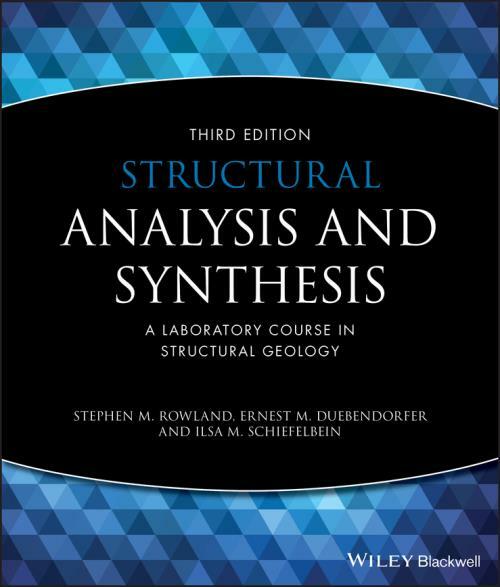 This widely used, highly readable introduction to structural analysis is specifically designed to support the laboratory work of undergraduates in structural geology courses. Throughout the book, a geologic map from a mythical site, the Bree Creek Quadrangle, is used to help students analyze various aspects of the geologic structures exposed within this quadrangle, and ultimately to combine these analyzes into a grand synthesis. Guided by students and instructors suggestions, the authors have refined several exercises and added new ones for this third edition. In addition, every figure has been redrafted to improve clarity, and the Bree Creek Quadrangle map has been compiled onto a single fold–out sheet. An instructor s manual is available on request from the publisher to assist the laboratory instructor in the use of the book. 1. Attitudes of Lines and Planes. 2. Outcrop Patterns and Structure Contours. Determining outcrop patterns with structure contours. 3. Interpretation of Geologic Maps. Determining exact attitudes from outcrop patterns. Determining stratigraphic thickness in flat terrain. Determining stratigraphic thickness on slopes. Determining stratigraphic thickness by orthographic projection. Determining the nature of contacts. Structure sections of folded layers. Structure sections of intrusive bodies. Line of intersection of two planes. True dip from strike and apparent dip. Strike and dip from two apparent dips. Fold classification based on dip isogons. 7. Stereographic Analysis of Folded Rocks. Determining the orientation of the axial plane. Constructing the profile of a fold exposed in flat terrain. Simple equal–area diagrams of fold orientation. Determining the Fold style and interlimb angle from contoured pi diagrams. 8. Parasitic Folds, Axial–Planar Foliations, and Superposed Folds. 10. Dynamic and Kinematic Analysis of Faults. Structural synthesis of the Bree Creek Quadrangle. Common errors in geologic reports. Equipment required for this chapter. Elastic deformation: instantaneous, recoverable strain. Viscous deformation: continuous strain under any stress. Plastic deformation: continuous strain above a yield stress. Within every rock is a little dashpot. The Mohr circle of stress. The importance of pore pressure. The coaxial total strain ellipse. The noncoaxial total strain ellipse. Deformed fossils as strain indicators. 15. Construction of Balanced Cross Sections. Relations between folds and thrusts. Requirements of a balanced cross section. Constructing a restored cross section. Constructing a balanced cross section. 16. Deformation Mechanisms and Microstructures. Oblique grain shapes in recrystallized quartz aggregates. 17. Introduction to Plate Tectonics. Focal–mechanism solutions ( beach–ball diagrams). A: Measuring attitudes with a Brunton compass. C: Greek letters and their use in this book. D: Graph for determining exaggerated dips on structure sections with vertical exaggeration. F: Common symbols used on geologic maps. G: Diagrams for use in problems.